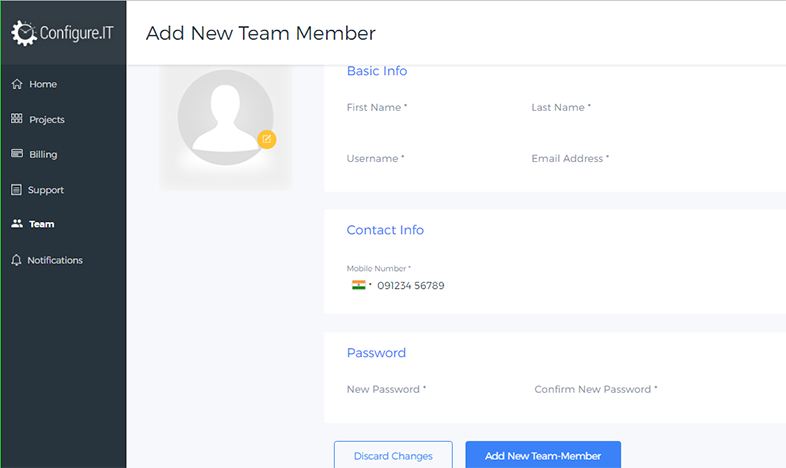 If user has subscribed for Team plan then he would see “Team” on the left hand menu on his home page. Clicking on it will redirect the user to page from where he can manage his team. It shows the list of team members listed with their first & last name, email address and phone number. There is always an option to add new team member. If Admin has rights, he can edit the profile of the child user. All the fields in his profile except email address can be changed. Changing password is also possible from this screen only. Clicking on “Update Info” will save the changes. 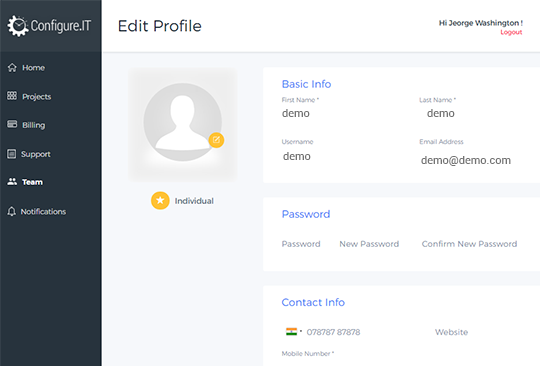 Even child user can login into his account and edit the profile. Permissions / access is given on these basis: System Permissions and Project Access. Add Preview User : Check this option if you want to give right of adding PreviewIT App user for the assigned project to the team member. Delete Project : Check this option if you want to grant permission to delete assigned project to the team member. Billing : If team member can access billing section then check this option. 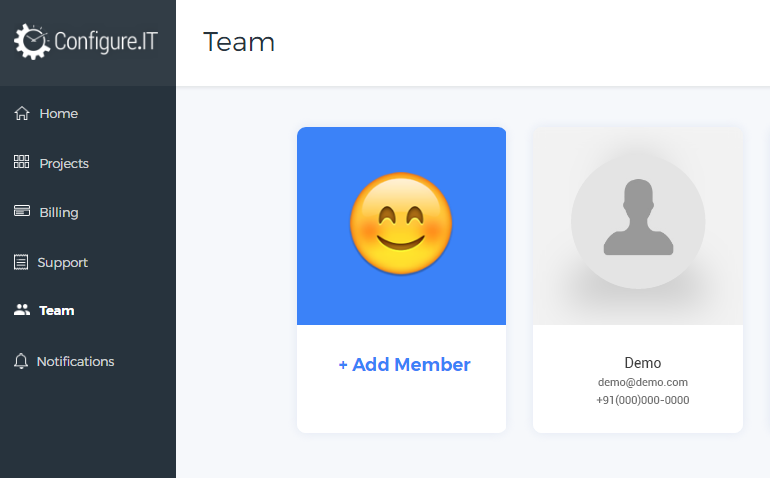 Create Project: If you want to give right to team member to create new project then check this option. Is Admin : Checking this option means providing full-on Admin rights to the team member to act as Admin. Add user to project : Check if team member can add new user for the assigned project. Archive Project : Check if project can be archived by team member. Project Access : This shows list of assigned projects and unassigned projects. User can search the project by name in both the lists. Clicking on “+” sign adjacent to the name of the project in unassigned list will add the project in Assigned Projects list. Clicking on “X” near the project name in assigned project list will remove the project and child user won’t be able to access it. If user want to remove this member and take Configure.IT access from him then this option can be used. It will ask for confirmation before deleting. Once deleted, all the permissions and rights data will be deleted from database and would not be able to rollback. Note : We always recommend to revoke the permissions instead of deleting the user, if not necessary to delete and keep the data intact. 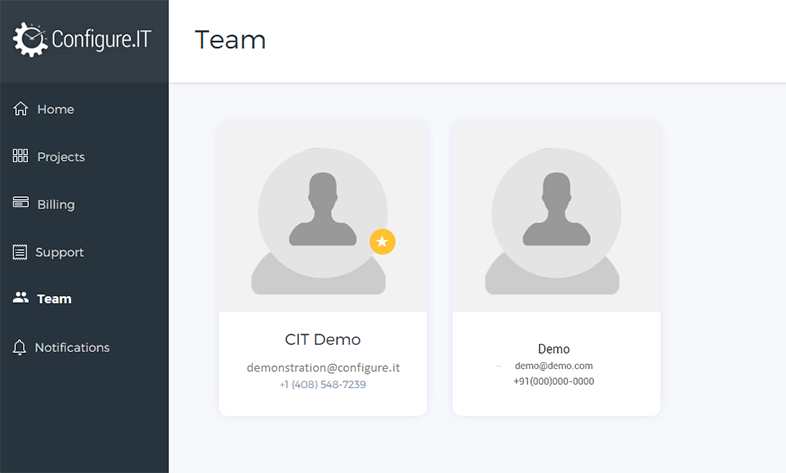 There are different team plans available at Configure.IT. Depending upon the access provided in each plan, user can add the new member to the team. If user wants to build a team, he can add member by clicking on “+Add Member” option. Clicking on it will redirect the user to fill a form with basic information of the new member. Form will contain information like First Name, Last Name, Username, Email, Phone Number and Password. Upload display image is also an option given while adding new member. If the limit has been reached for number of users then notification message will be displayed with option either to Continue with the same plan or Upgrade. Once the user is added, he will get validation link on his registered email address to verify the user. 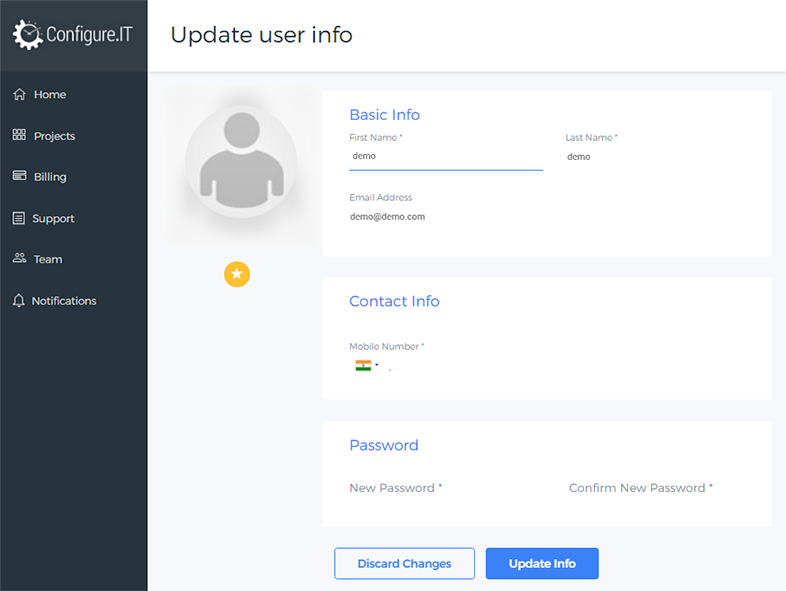 As soon as user is verified, he will be redirected on Configure.IT platform. By clicking on “Team”, child user can view all other team members. Member with Orange Star is an Admin. Hovering mouse over the other team member will allow the use to see extra information, if any. He can just view the team member list and their contact information and can’t modify any permission unless and until he is given rights for the same .